James Cowie Geddes was born in Gallowgate in the Civil Parish of St Nicholas, Aberdeen, Scotland on 28 December 1884, the 4th child of John Geddes, a plumber (journeyman), and his wife Elizabeth. By the time of the 1901 census, the household included three older siblings - Isabella (22), John (21) and Minnie (18) - and five younger siblings - Charlotte (14) and Mary (11), Georgina (9), William (6) and Alexander (3). The census showed that John worked in ‘provisioning’ and James was employed as a ‘messenger’, while the three older girls were employed as jute spinners. By the 1911 census, John Jr and Minnie had left home, but James and the other siblings were still living with their parents. John Sr, still a plumber, and James, now listed as tinsmith, both worked at a ‘provisioning factory’. James’s attestation papers from his later enlistment in the AIF indicated that he served 5 years as a plumbing apprentice with William Walker & Sons in Aberdeen. An internet search shows that this company dealt in tea, coffee, wine, spirits and cordials, and can probably be classified as ‘provisioning’. Its advertisements in the Aberdeen Journal noted that its tea was supplied in ‘handsomely decorated tins’, and James as a tinsmith may have been employed in making these. In fact all of the men of the family possibly worked for Walker & Sons, because William’s occupation in 1911 indicates that he was employed in the delivery of aerated waters. In May, 1914, John Snr, Elizabeth, Charlotte and a young child, also James Geddes (aged 4), are recorded as embarking from Glasgow for Montreal, Canada, on the Grampian. The younger James may have been the son of Charlotte. No definite record can be found of James Cowie Geddes himself leaving Scotland, nor can a record be found of his arrival in Australia in the interval between 1911 and 1916. However, James appears to have been in Brisbane long enough to have made acquaintances, because his service record contains two letters from a Mr John Palmer to the Army. In the first letter, Mr Palmer was enquiring after James’s correct mailing address and noted that some others were also interested in having his address. 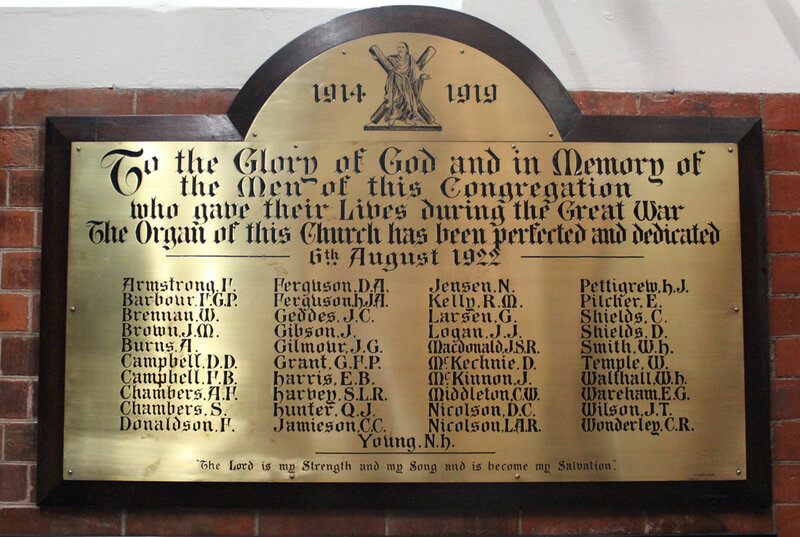 In a subsequent letter Mr Palmer asked for his service number, having seen a J.C. Geddes listed with the casualties. In this letter, Mr Palmer signs himself as Wharfinger (manager) at the Short Street Wharf. This wharf, owned by Thos. Brown and Sons, was located under what is now the Riverside Expressway at the end of Margaret Street. Perhaps James had been employed at the wharf. John Palmer had previously been mate on the Lady Norman, a ship involved in the blackbirding trade. James’s attestation paper on enlisting in Brisbane in 31 July 1916 gives his age as 30 years and 7 months, although his birth registration shows he was actually a year older. He gave his occupation as plumber and his next-of-kin as Mrs Elizabeth Geddes of 131 Cumberland Street, Port Arthur, Ontario, Canada. James was 5 feet 5 inches tall with a dark complexion, brown eyes and black hair. His religious denomination was recorded as ‘C. E.’, and begs the question of how he came to have a connection with Saint Andrew’s Presbyterian Church. 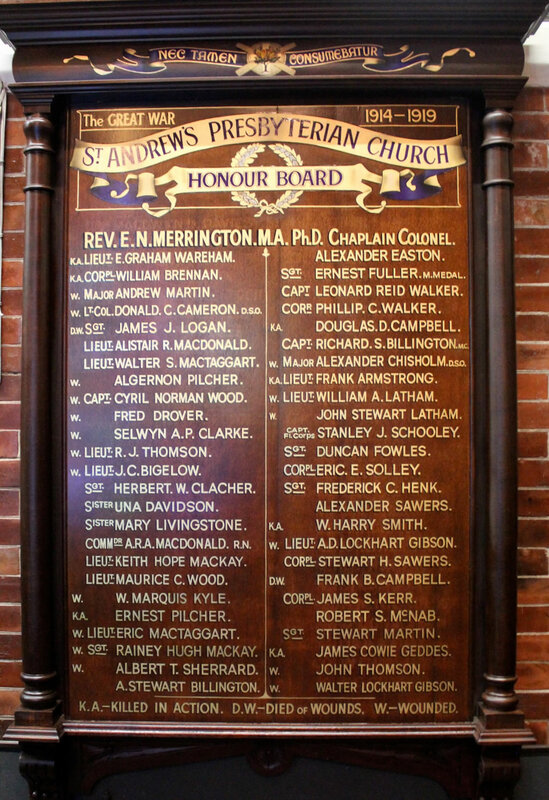 His name was not listed amongst the members in 1916, but the appearance of his name on the honour board suggests that he must have been known to some members of the congregation. Perhaps he attended with someone who befriended him while in Brisbane. He was assigned to the Field Company of Engineers and embarked on the Orsova on 2 December, 1916 as part of the December Reinforcements. He disembarked at Plymouth on 17 February 1917. After a period of training at the Australian Engineers Training Depot at Brightlingsea, he proceeded to France arriving at Etaples on 26 May and then to Pouelles on 15 June when he was taken on strength as part of the 11th Field Company Engineers. The service does not record what action he saw. It merely indicates two admissions to hospital, the first late November, when he spent several days at 14th Australian Field Ambulance apparently suffering from a reaction to inoculation. He was again admitted to hospital on 12 January 1918 for a week due to a bout of diarrhoea. Sapper James Geddes was seriously wounded in action on 15 June 1918 and died of those wounds the same day after having had his right leg amputated at the 10th Australian Field Ambulance. He was buried at Longueau British Cemetery. His headstone records his age as 34 years. The town of Longueau is on the south-eastern outskirts of Amiens and the British Cemetery is on the eastern side of the town beside the road to Villers Bretonneux. The cemetery was begun in April 1918, when the Allied line was re-established east of Amiens after the German Spring Offensive; it was used by fighting units and field ambulances until August, when the Germans were forced back after the Battle of Amiens. Longueau British Cemetery is relatively small and contains only 204 First World War burials, 14 of which are unidentified. Two Second World War airmen are also buried in the cemetery. Longueau Cemetery is in some ways an even sadder place to visit than others on the Western Front, tucked in beside commercial buildings beside a busy road, rather than surrounded by the tranquillity of the countryside. James’s story is also sad — his family scattered between Scotland and Canada, and he himself moving to another country, and then like thousands of others, caught up in the tide of world events, losing his life and probably unknown to descendants of his siblings. This story, piecing together what little can be gleaned of his life, ensures that he is remembered and honoured in Brisbane so far from his place of birth and family. • Britishnewspaperarchive.co.uk, Aberdeen Journal - Wednesday 01 January 1902. Accessed by Ian Withnall 30 August 2015. • Scotlandspeople.gov.uk, 02/04/1911 Geddes, James (Census 1911 168/01022/00021). Accessed by Ian Withnall 16 August 2015. • Scotlandspeople.gov.uk, 1885 James Cowie Geddes (Statutory Births 168/010085). Accessed by Ian Withnall 16 August 2015.